The Lladro company, created by brothers Juan, José and Vicente Lladró began with their first porcelain creation in 1953. It wasn’t until 1958 that the brothers moved their company to a warehouse near Tavernes Blanques and began working full-time on their porcelain ornaments. This further investment of time by the three brothers, lead to the expansion of their company and a Lladro identification mark was officially introduced in 1960. Although the Lladro company is young in comparison to other well-known porcelain designers, often ornament owners are interested in finding out when their piece was created. 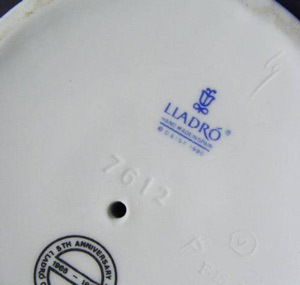 Many Lladro pieces can be aged according to their unique ‘Identification Mark’. 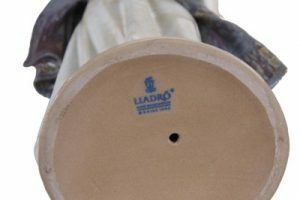 The identification mark on the bottom of a Lladro figurine also strengthens the authentication of the piece. A Lladro ornament that was made after 1960 that lacks an identification mark is most likely a counterfeit piece. During 1986, Lladro also embossed a 4 digit ID on the bottom of each of their figurines whereas before these I.D’s were on the original box. This came after counterfeiters became knowledgeable of the value of Lladro ornaments. The first official Lladro mark appeared on porcelain figurines during 1960. This mark was impressed into the bottom of the figurines and was used up until 1963. This marking had the Lladro name at the top with the first ‘L’ underlining the rest of the word. Beneath the word ‘Lladro’, the identification read: ‘Espanna’ and ‘Made in Spain’. 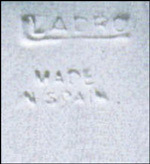 Similar to the first official marking, Lladro introduced a new company identification in 1964. This identification was impressed into the bottom of Lladro figurines although does not read ‘Espanna’ below the ‘Lladro’ name. In 1971, the old impressed markings were replaced with a blue-black stamp. This particular stamp was used from 1971 until 1974 and appeared at the bottom of Lladro pieces. 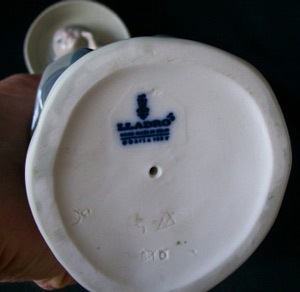 This identification mark is the first time the Bell-flower was used which remained a staple Lladro logo until the present. As the years went on the Bell-flower became more intricate. 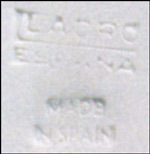 Furthermore in later Lladro identification markings, a accent mark is visible above the ‘O’ in Lladro and the wording ‘Made in Spain’ was replaced with ‘Hand Made in Spain’. The fourth marking that appeared on Lladro pieces between 1974 and 1977 came in blue and black. Similar to the previous identification marks, this factory mark was placed on the bottom of the figurine. This fourth edition features an accent over the ‘O’ in Lladro and a trademark symbol. Used from 1977 until 1984, the fifth Lladro factory marking again appeared in a black stamp. An acronym ‘DAISA’ appeared at the bottom of the marking and represented: ‘Disenos Artisticos E Industriales, S.A.’. This was added due to the fact this company was now operating as a subsidiary of Lladro. This company was used to protect the Lladro design and copy rights. 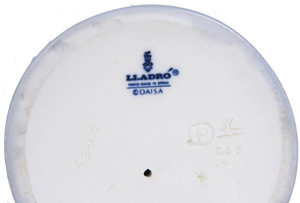 Very similar to the previous factory marking, the sixth Lladro marking was used from 1984 until 1989. This marking includes the copyright date next to the DAISA acronym. Recognized today is the seventh edition of the Lladro factory markings. This stamp originated in 1990 and is still used on Lladro figurines today. This is a blue-black stamp that has a simplified version of the Bell-flower. The Bell-flower is now the tulip logo that many people associate with the Lladro company. The font of the word Lladro was also changed in this new identification mark. A special Lladro mark was stamped on porcelain figurines that were designed originally for members of the Lladro Collectors Society. This stamp was blue in color and reads ‘Collectors Society 1998‘ around the outside of the Bell-flower Lladro Logo. The Bell-flower is a central logo within all present day Lladro identification markings. The flower is included due to its significance in Spain where the Lladro company first began and as a tribute to both nature and the mother of clay. Ask to see the bottom of the Lladro figurine. Look and ensure the authenticity of the identification mark. Compare the asking price with the same or similar pieces within the online market. Ensure the serial number of the piece is within the range for the limited number produced. It is best to always buy Lladro ornaments from a reputable source. There are many websites that specialize in selling authentic Lladro works of art.